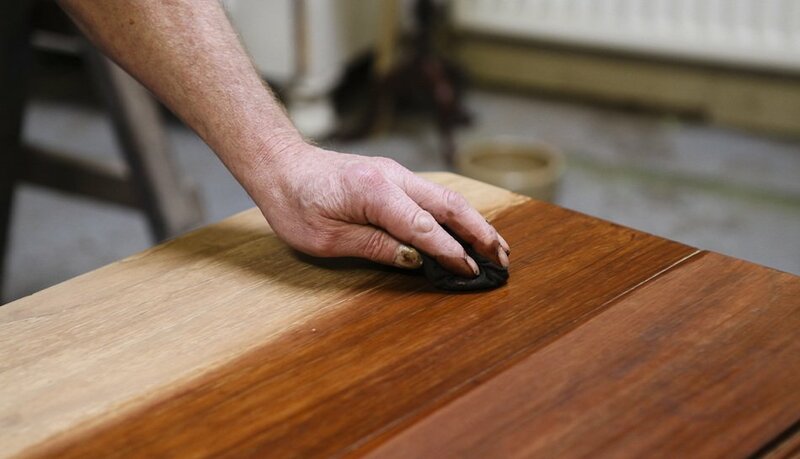 Our Wood polishing or finishing covers a wide range of different materials and methods of application. The purpose of polishing is to protect the wood and to bring out the beauty and lustre of the grain and colour. Our team of painters perform quality work that will make the shine last for many years. The wood polishes offered are non-alcoholic, high grade resin based and exhibit superior gloss properties. Our Wooden Polishing Services are available in different variety at very reasonable prices ranging from economy to high grade. At Freshcoats, we’ll work with you to determine what polish will work best for your furniture piece regarding practicality and style. We’ll also make sure to seal any metal away while polishing to preserve the integrity of those metallic elements—which we can polish with another multi-purpose or metal polish. What are the different kinds of polish finish? There are primarily four kinds of polish finish. French polish: This is the oldest and traditional form of polish. This polish is made of lacquer, resins and solvent, mixed by hand and applied by hand. It gives a traditional smooth finish and can be stained in different wood colours (yellow, rosewood, teak brown etc). Since this the traditional form of polish and applied by hand and labour oriented, it is the most economical form of polish for wood. French polish is semi gloss by nature. Melamyne polish: This is a superior polish finish polish which comes in ready to use packs and is mostly applied by spraying on various wood surfaces. This polish is more durable, more water resistant than French polish. It comes in matte and gloss finishes. Monocoat: Monocoat is a single coat highly durable polish finish for wooden surfaces. By nature, it has a matte finish. Very durable and resists all kinds of stains caused during everyday use. On which surfaces can polish be applied? Polish can be applied on all kinds of wood surfaces or variants of wood like Veneer sheets. Furniture, wooden flooring, wooden ply can all be polished. Polish cannot be applied on laminates, MDF sheets or metal surfaces. Shera ply, a substitute for wooden panels can also be polished. What’s the kind of Polish I should apply on my wooden surface? It depends on the kind of wooden finish. As a general rule, people prefer to apply more durable, higher polish finishes to wooden surface that is more durable. Eg: People prefer to apply polyutherane (p.U) polish to expensive veneer. For normal mouldings, ply, wooden furniture, French polish or melamine polish. Can polish be done in various colours? Polish can be done in limited colours. The colour choices in polish are not as exhaustive as paint. Usually polish colours are done to match the wooden surface, hence wooden stained colours are the most widely used. What is the process of Polishing? All surfaces that need polishing require two basic processes repeated over and over again depending on the finish desired. Sanding: All wooden surfaces, old or new require sanding to be done. Sanding is done to smoothen the surface imperfections and the polish finish subsequently. Polish Application: Polish application is done repeatedly in most kinds of products. French polish is applied repeatedly by cloth on the wooden surface till an even finish is obtained. Melamyne and Pu polish is sprayed in successive coats over the wooden surface till the desired wooden finish is obtained. What happens to the dents, pin holes in the wooden surface? Are they taken care of during the polishing? Dents, pin holes, screw marks are sanded and filled with an all purpose wood filler, before applying polish. The wood filler is also stained usually in the same colour as the polish which is to be applied, so that the filling underneath the polish is not visible. I just want to make my old, dull polished furniture look new and presentable? Should I polish it or is there something easier that can be done? Applying a coat of lacquer will make the dull furniture come to life. Lacquer can be applied by brush or by spray. Polishing would be required if you want to change the existing polish colour of the furniture. How long does polishing of entire wooden surfaces of a 2bhk flat take? That would depend on the quantity of furniture in the flat and the kind of polishing required. Usually a heavily furnished flat having lots of wooden surfaces would take around 7-8 days. How long does the smell of Polish last? Polish is generally quick drying and does not have a lingering smell as paint does and certainly not for as long a duration as paint. However due to solvents and resins, it does have a strong smell which lasts for about a day. Can melamine and PU polish be done in my home after painting? Or while we are living? Melamine and PU polish should not be ideally done after painting of the wall is finished. We advise our clients to get the polishing completed and we cover the polished surfaces suing covers and then paint the walls. The residue of the polish while being sprayed can stick onto the walls and ceilings and can make the finished painted walls look bad. French Polish or Monocoat, which are applied by hand can be done after painting work. Any kind of polish can be done while one is living. What kind of stains can polish whitstand? PU, Melamine and Monocoat polish can withstand most of the stains, like water stains, tea stains and wax drops.